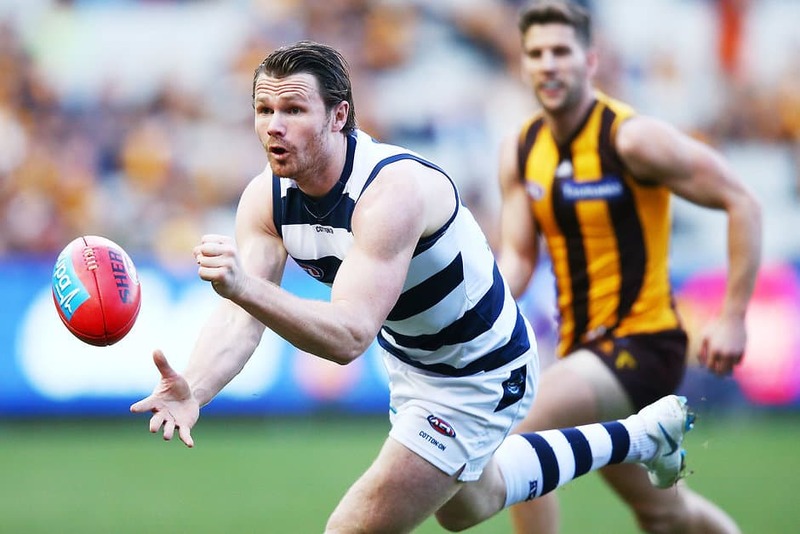 PATRICK Dangerfield and Brodie Grundy have been the most-selected players since the official Fantasy game of the AFL launched a few days ago. As a MID/FWD, Dangerfield could be the highest scoring forward this year if he can return similar numbers to his first two years as a Cat, in which he averaged 117.9 and 120.5 respectively. The 28-year-old may spend more minutes in the midfield in 2019 and in turn, his Fantasy numbers should increase. Grundy appears in half of the completed teams so far, despite his hefty price tag. The big Pie averaged 120 last season and is backed in by Fantasy coaches to be the clear No.1 ruckman. Jake Lloyd and Rory Laird are popular premium defenders, while the GWS 'Dash Brothers', Lachie Whitfield and Zac Williams, are set to be a formidable duo. The latter has received a 30 per cent discount on his 2017 average due to not playing in a home-and-away fixture last season, making him one of the value picks in defence. Coaches who have made their teams early have locked in former Giant Will Setterfield as a dual-position player in the forward line. The heavily discounted Blue is coming off an ACL suffered last pre-season and if named for round one, he could be one of the best cash cows of the year. No.1 pick at last year's NAB AFL Draft, Sam Walsh, is the highest-priced draftee. While more expensive than all other draftees, his $270,000 price tag isn't scaring off too many prospective buyers. Job security is one of major factors taken into account when selecting a first-year player and Walsh is looking set to be a regular member of the Blues' 22. Following Walsh as the most-owned midfielder is Jack Macrae. When Fantasy Pig Tom Mitchell went down with injury earlier this month, Macrae's stocks rose and is the captain choice of 18.4 per cent of the competition. Every team needs some of the bargain basement players and coaches have been quick to snap up some of the names that have been touted for a round-one debut. Darcy Fort is in the mix to ruck for the Cats and he is probably the best option for an interchange spot in that line. Darcy Cameron played one game for the Swans last season and sits next to Fort as the preferred bench combo. Mature-aged recruits Brett Bewley and Nick Hind are impressing this pre-season. The Docker and Saint will be keen to show their wares during the JLT Community Series and press their claim for a round-one berth in their respective sides … and thousands of Fantasy Classic squads. Gold Coast could be a source of many Fantasy bargains. Former SANFL swingman Chris Burgess is in a quarter of the teams picked so far. He is joined by Sam Collins (selected in 19 per cent of teams), Joshua Corbett (19 per cent) and Izak Rankine (17 per cent) as first-year Suns that might make some cash early in the season. Anthony Miles (18 per cent) is the 10th most-selected midfielder. Below is a squad of 30 made up of the players with the highest Fantasy ownership. To keep it under the $12.8m salary cap, a premium may have been overlooked in order to give the team a realistic structure. Alex Witherden is the seventh on the list, but was replaced by the ninth-most selected defender and No.5 pick in last year's draft, Connor Rozee. The midfield is where a lot of variety in selection appears to be this season. Dan Hannebery is too cheap to ignore and including the discounted Brad Crouch (17 per cent) and Miles helps keep the team in under the cap. Josh Dunkley would preferably be placed in the forward line, but he provides a dual-position link in the midfield for added flexibility in the side. Although Max Gawn in the most common second ruck next to Grundy, his $808,000 price tag kept him out of this side for the fifth- most-selected ruckman, Zac Clarke. At $270,000, the Bombers' recruit will make some quick-fire money if he is playing regular games. Behind last year's top forward Devon Smith and the highly owned Dangerfield is Chad Wingard. Coaches are bullish on the Hawk following the trade period as he could gain extra midfield time due to Mitchell's injury. Value follows with the last five spots made up players appearing in 16 per cent or more teams. And $177,000 remains in the salary cap.